The scene which he enters is a Cold War landscape of moles and lamplighters, scalp-hunters and pavement artists, where men are turned, burned or bought for stock. Smiley’s mission is to catch a Moscow Centre mole burrowed thirty years deep into the Circus itself. Another month, another book to make you go Ooooh. This month’s book was a classic spy thriller. For a few of us our first taste of this story came from the recent film of the same name although one reader remembers a TV show with Alec Guinness in the 1980’s. The book is also part of a trilogy with everyone remembering the third book Smileys People but no one recalling the second The Honourable Schoolboy. We felt it was a slow burner and found ourselves slowing down our reading pace to accommodate this. Everyone agreed the writing was beautiful and we liked that there was no attempt to explain certain things such as the slang words used in the book. 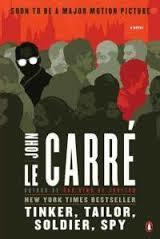 It’s spycraft language and Le Carre expects his readers to understand it as everyone uses it in the book. We thought the character of Ricky Tarr was like James Bond without the glamour. This led us to a Man from UNCLE tangent and the fact that no one should have to watch the new Fantastic Four film. We thought the book was of it’s time but made better by the fact Le Carre was a real ex-spy and discussed the fact he owns a mile of cliff near Lands End. This led us to discussions on rows and rows of filed and the reliance of paperwork rather than google and computers of todays super spies. More tangents – this time comparing Gary Oldmans’ nondescript face versus his overacting face. We agreed that in the film of this book he had his nondescript face which helped the movie. There are no straight lines in the story, it weaves in and out of various threads meaning teh reader has to concentrate which is not always good for the MTV generation who want fast pace and short chapters. We also liked that there was no definitive ending but did discuss the different ending to the film.